Add some more sparkle to your life with our new service, Glitter Roots! It's a 15 minute stand alone appointment or you can add it to your current services in the salon if there is time available. You can choose 1-3 different colors, in a wide variety of glitter. They are custom mixed and suited to your hairstyle and painted directly on your hair with a paint brush! It's a temporary, easy to wash out, $10 commitment! 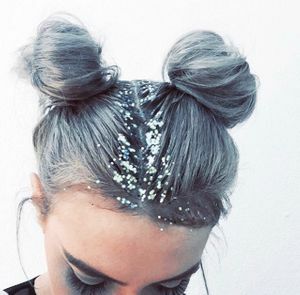 So whether you're going to a festival, or you just got a fresh cut and want to show it off, glitter roots are the way to go!